Hunting The Moon Tribe Book Release party at the Hollywood theater! If you’re in the Portland area, join David Agranoff (as well as myself, Eraserhead Press, and others in the PDX bizarro fiction scene) at the Hollywood Theater tonight at 7pm for the release party of his new novel “Hunting the Moon Tribe.” There will be vegan cake, classic Kungfu and horror movie trailers on the big screen, books on sale, signing, and total geek madness. 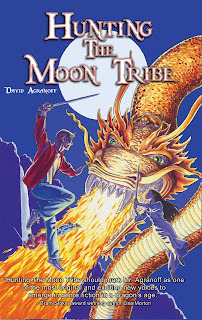 “David Agranoff’s HUNTING THE MOON TRIBE mashes up Chinese mythology, some seriously unnerving horror, Maoist politics, a sweet coming-of-age story, dark magic, and high-kicking martial arts into a compelling and unusual page-turner. I’ve never read (or seen) anything like it, and HUNTING THE MOON TRIBE should mark Mr. Agranoff as one of the most original and exciting new voices to emerge in genre fiction in a dragon’s age.” – Lisa Morton Three time Bram Stoker award winning author of The Castle of Los Angeles and The Cinema of Tsui Hark. This entry was posted on May 5, 2011 at 4:06 pm and is filed under Uncategorized. You can follow any responses to this entry through the RSS 2.0 feed. You can leave a response, or trackback from your own site.